Welcome to your Father’s House! Formed in love by the Creator, made new by the Son, led by the Spirit. We are grateful for the generations who built our Cathedral with stone and wood, spirit and perseverance. We are grateful for their steadfastness in times of world conflict, their bravery in the face of loss and their tenacity in the midst of upheaval. We are grateful for their handing down legacies of loyalty to their religious practice and for their examples of commitment to their Church. We have faith that as the body of Christ we will be directed by the Spirit in the decisions that we must make. We have faith that our presence makes a difference in society and that we are a symbol of the Kingdom of God. We have faith that we as the Church are a witness to the mystery of the divine in our midst. We have faith that the time we volunteer and the ministry we give to others is a tangible sign of God’s care for us. We will place our hope in the promise of Jesus that nothing will prevail against His Church. We will proclaim the Gospel and speak the Word with boldness to those who hunger for the truth. We will evangelize through scripture, sacraments and charity. We will trust in the transforming power of the Holy Spirit to make us the people we have been called to be. We welcome you to your Father’s House! Whether you just moved into town, or have recently decided to make the Pro-Cathedral your spiritual home, or have rediscovered us after a time away, we are delighted and hope that you find a place of real welcome in our parish community. Don’t hesitate to call on us if we can assist you in your spiritual journey. 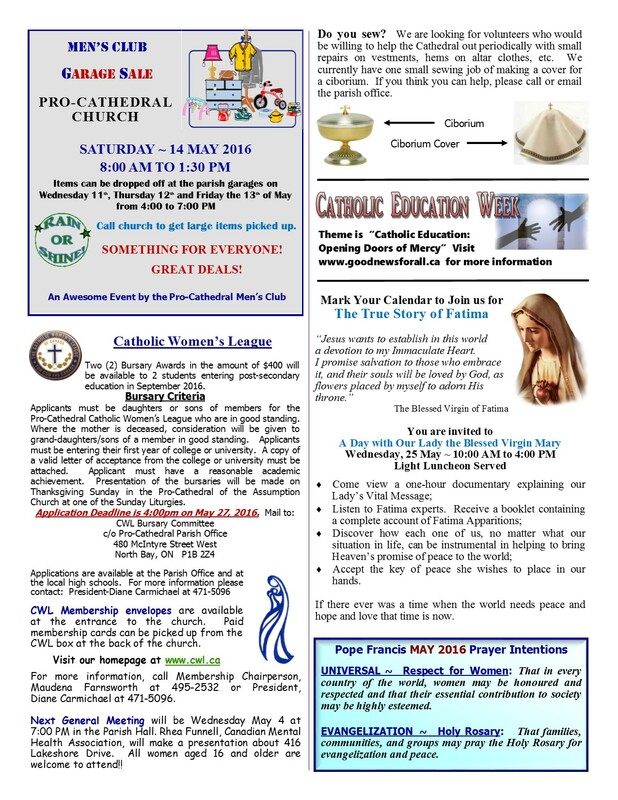 Please register with the parish so that you can take full advantage of the many programs and possibilities that make the Pro-Cathedral a wonderful community of faith. Introduce yourself when attending mass – we would love to meet you and personally welcome you to the parish. The Pro-Cathedral is located in downtown North Bay. Located between Algonquin Avenue and McIntyre Street West. You can’t miss our huge, white limestone building. If arriving from the South, take the Lakeshore exit and follow this road until it becomes McIntyre Street. Follow McIntyre Street and it becomes Algonquin Avenue leading you directly to our front door. If arriving from the North, East or West, when you meet at the Hwy. 11/Algonquin Avenue lights, take Algonquin Avenue South and follow until you see the Pro-Cathedral on the right hand side. We look forward to your arrival. Easter Insert – Memorial Flower Remembrance, Bishop’s Easter Message & More! Following Christ Registration Form – Register Now! 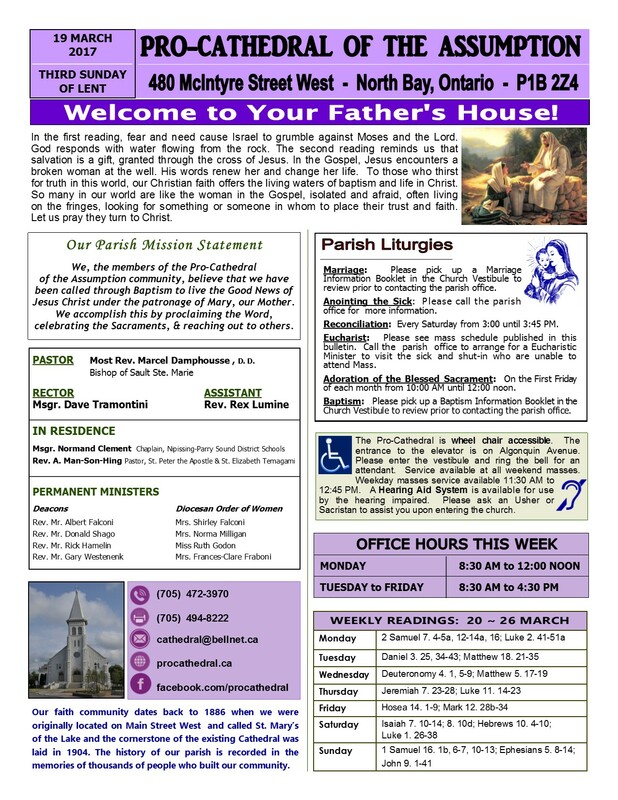 Bulletin Insert: Holy Week Schedule, Readings, Summit, & More! Bulletin Insert: Check out our CWL Swag, All-in Youth Conference, The Summit and our Next Gathering for our Truth & Reconciliation Gathering! 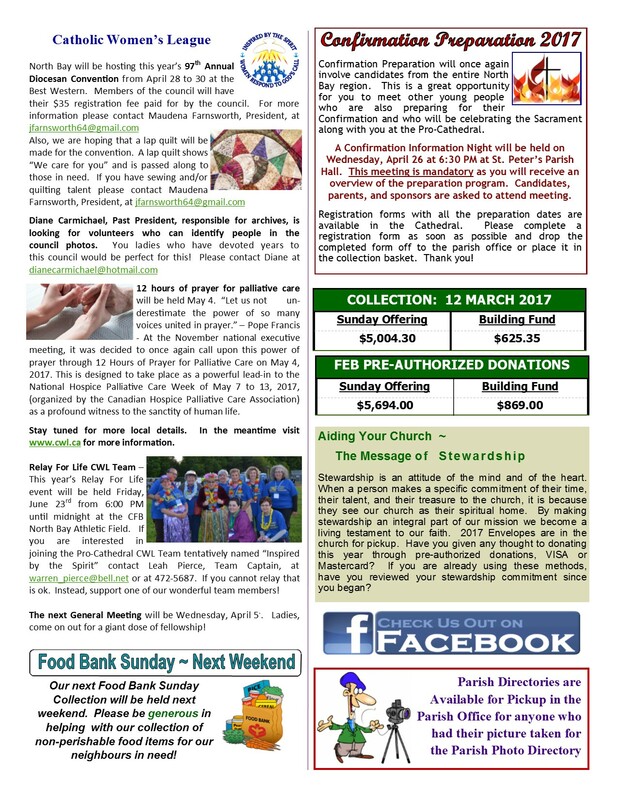 Bulletin Insert: Solidarity Walk & Hunger Meal Next Friday, CWL News, St. Paddy’s Day Thank You & More! 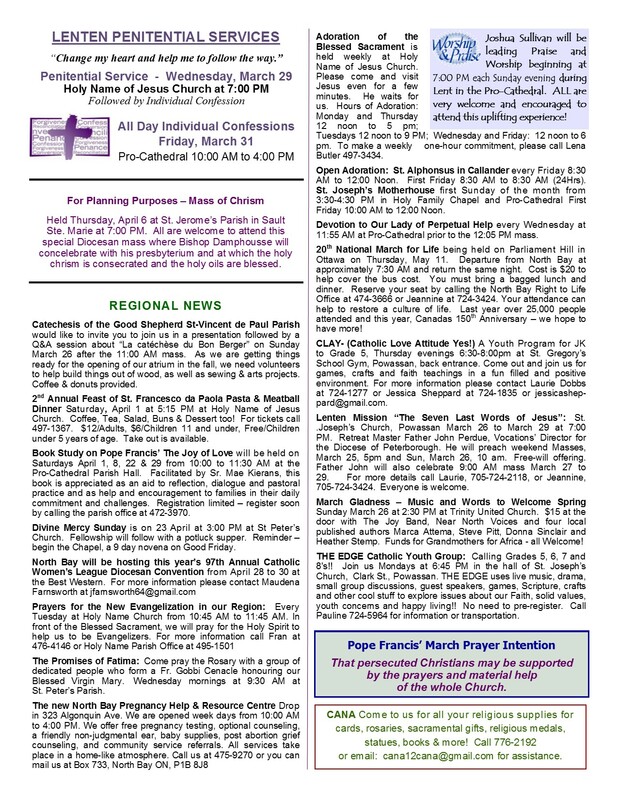 Bulletin Insert: 10 March – St. Paddy’s Day & TGIF!! Shrove Tuesday Pancake Supper – Tuesday night – Everyone Welcome! St. Paddy’s Day Social – Come and kick up you heels! Shrove Tuesday Pancake Supper Poster – Everyone Welcome! Circles of Dialogue and Reconciliation – Everyone Welcome! Free Breakfast Offered by the Knights of Columbus Next Weekend! Everyone Welcome! Insert: Circles of Dialogue and Reconciliation & Oktoberfest at the Cathedral – Tickets on Sale this Weekend after all Masses!!! Oktoberfest Poster – Everyone Welcome! Bulletin: 07 October 2018 – Happy Thanksgiving! Insert: Meet Your New Parish Council Members! Insert: Share the Journey – Development and Peace Insert – No one should be forced to flee their home! First Reconciliation & First Eucharist Registration Gathering – Pizza Night for the Whole Family! 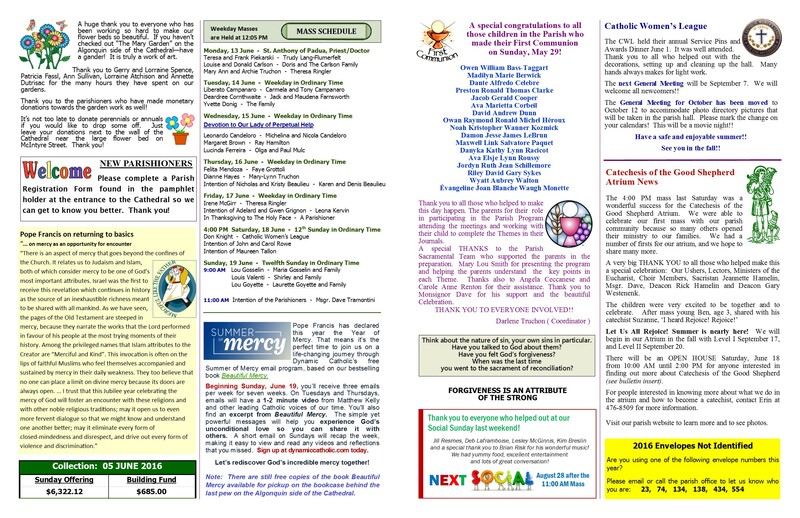 Bulletin Insert: 23 September 2018 – Parish Council Nomination Form, Special Autumn Gathering & More! Sharing Christ Begins Soon – Please register soon! Liturgy of the Word with Children – Gatherings Begin September 16 – Find Our More! Good Shepherd Atrium Open House: September 15 & 16 Before & After All Masses – Plan to Attend! Sharing Christ Begins September 11! Register Soon! Bulletin: 03 June 2018 – COME OUT TO OUR CONCERT – A Wonderful Potpourri of Music! Check it out! Concert next weekend, Women Helping Women Tea June 10th, Last week for our Scriptural Journey with Mary & More!! Bulletin Insert: Cinco de Mayo Pictures & Thanks! and Check out our Upcoming “A Musical Potpourri” Concert! You don’t want to miss it!!! Evangelization Summit Only Two Weeks Away! Please Register Now!!!!! 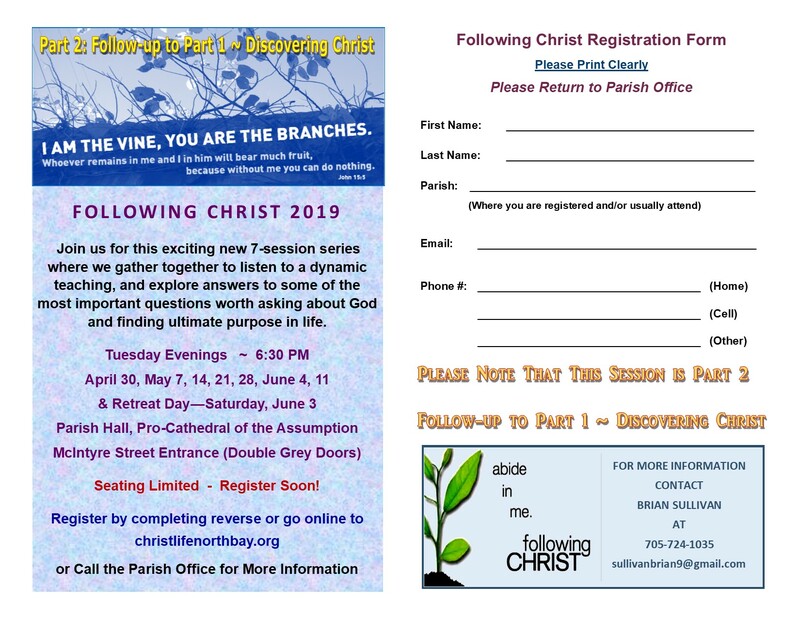 Following Christ Registration Form – Begins April 7th – Sign up Now!!! 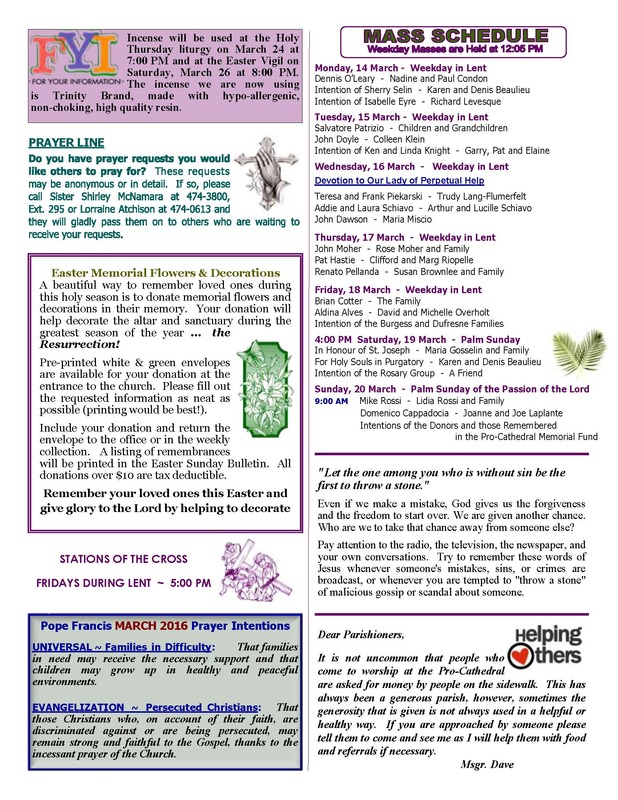 Bulletin Insert: 18 March 2018 – Mass of Chrism Invite – Holy Week Schedule – Registration for Following Christ! Bulletin Inserts: 11 March 2018: Hunger Meal next Friday – Everyone Welcome! Following Christ Registration – register soon! Check it out! Altar Servers Fun Day! Bulletin: 11 February Insert – Raise Your Voice! Summer Job Grant Program at Risk for Catholic Students & Healthcare Workers Have to Choose Between their Careers & Their Conscience – see how you can help! Parish Breakfast Thank You and Pictures – Thank you Everyone who Helped! Insert for Christmas Memorial Handout – Confirmation, Discovering Christ & More!! 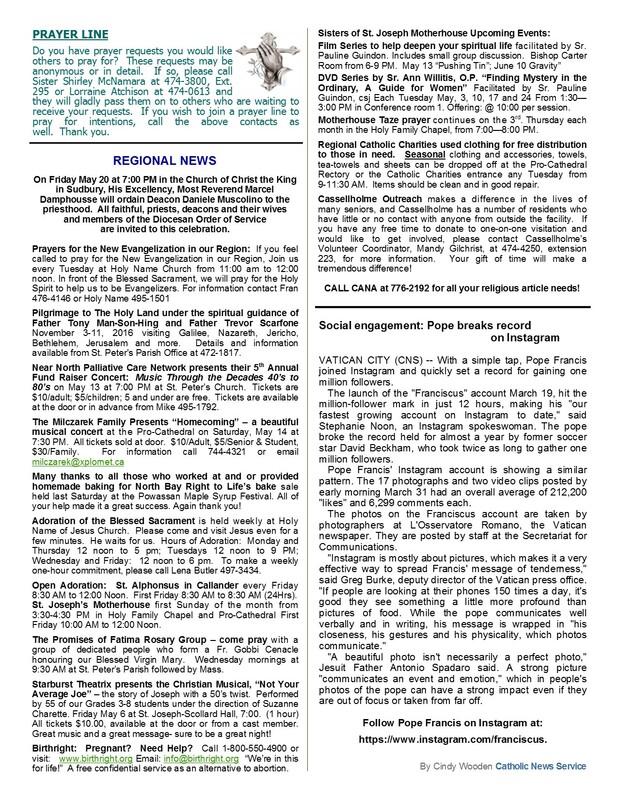 Bulletin Insert: 10 December CONFIRMATION, DISCOVERING CHRIST & MORE! Bulletin Insert: 19 November 2017 – Development and Peace “May Peace be with Her” Action Card Please sign and send to support women who support peace! Bulletin Insert: 22 October 2017 – CWL Bazaar News & It’s not too late to sign up for Sharing Christ! Bulletin Insert: 15 October – Join us for Sharing Christ! Check our latest CWL Bazaar News! Bulletin: 08 October 2017 – 27th Sunday in Ordinary Time HAPPY THANKSGIVING! 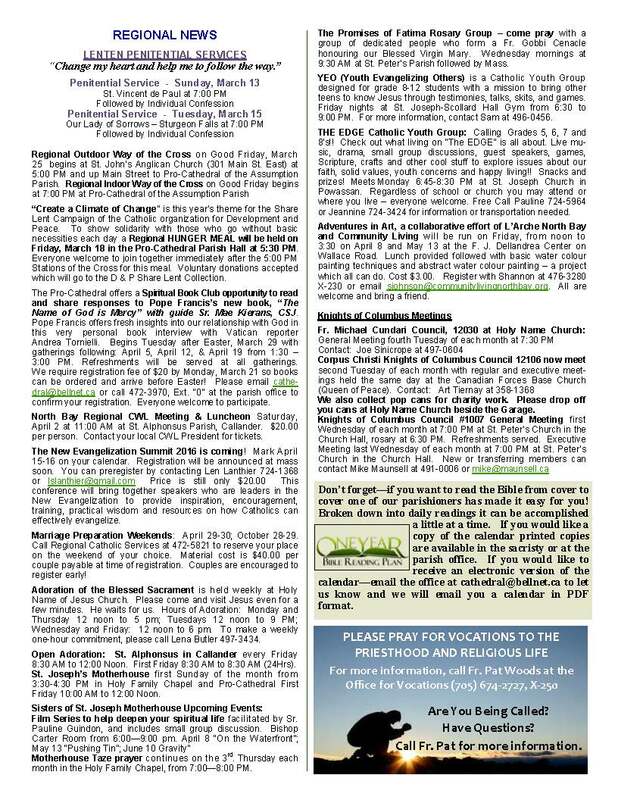 Bulletin Insert: 08 October – Check it out! Sharing Christ Registration and CWL Bazaar Convener List – see how you can help! Check out our Beautiful Glory Gardens! Ascending Life – Pentecost, A Celebration of the Appearance of the Holy Spirit! Men’s Club Garage Sale – June 3: Click here to find out how and when to drop off items – save your treasures! Catechesis of the Good Shepherd Atrium Parent Information Session – Join us! Evangelization Summit Coming Soon to North Bay! Check it out – Register Soon! Women Helping Women Spring Tea & Dessert Fundraiser – Join Us! Can you help with desserts, serving or making a donation of ingredients? See inside bulletin for contact numbers of who to call. 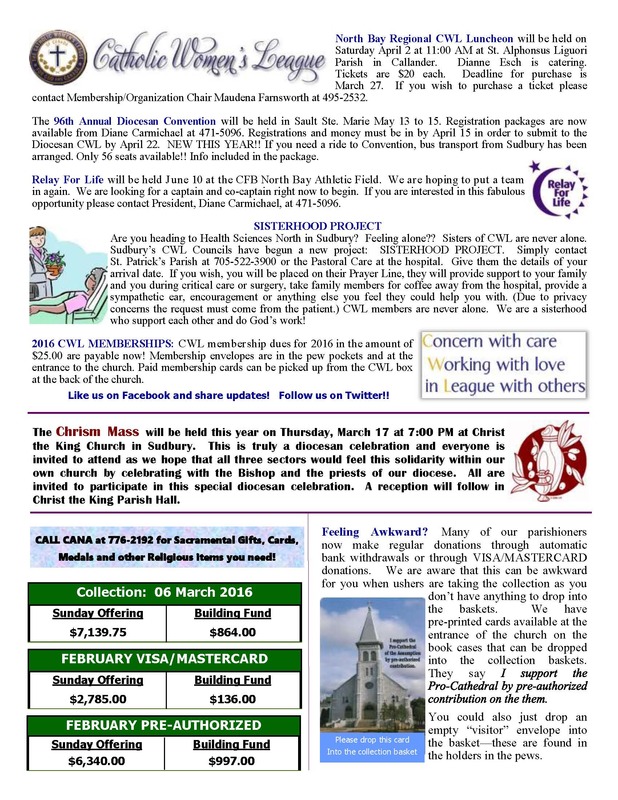 Catholic Women’s League – Ponderings Newsletter April 2017: Diocesan Convention, Spring Tea, Provincial Convention & More!! 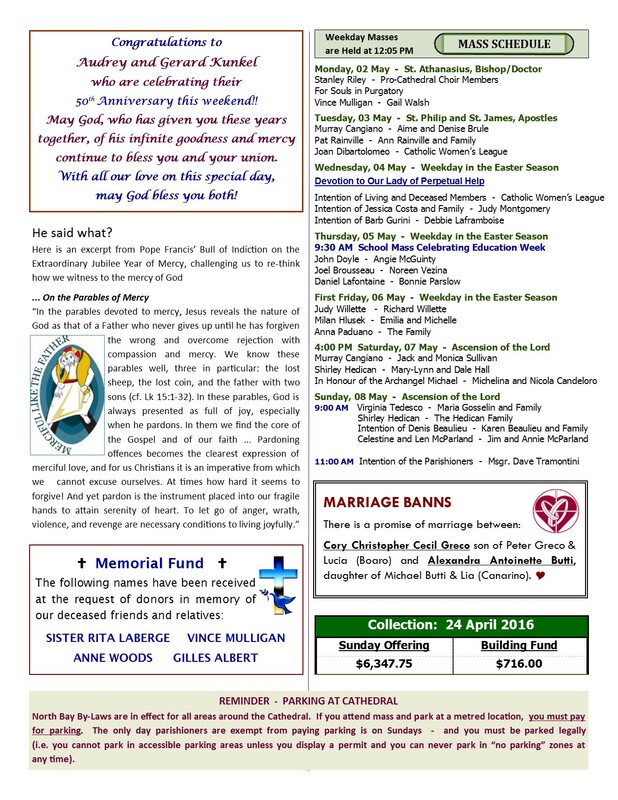 Bulletin – Easter Sunday – Rejoice! He has Risen! Reminder – Parish Photo Directories are Available in the Parish Office for anyone who had their picture taken! 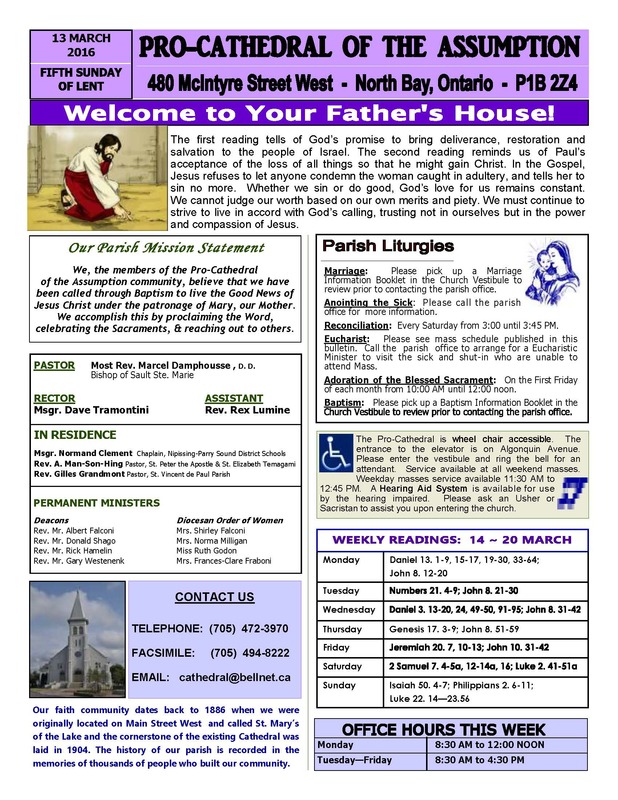 Bulletin Insert: Pancake Supper, Stations of the Cross Schedule, Penitential Celebration & More! 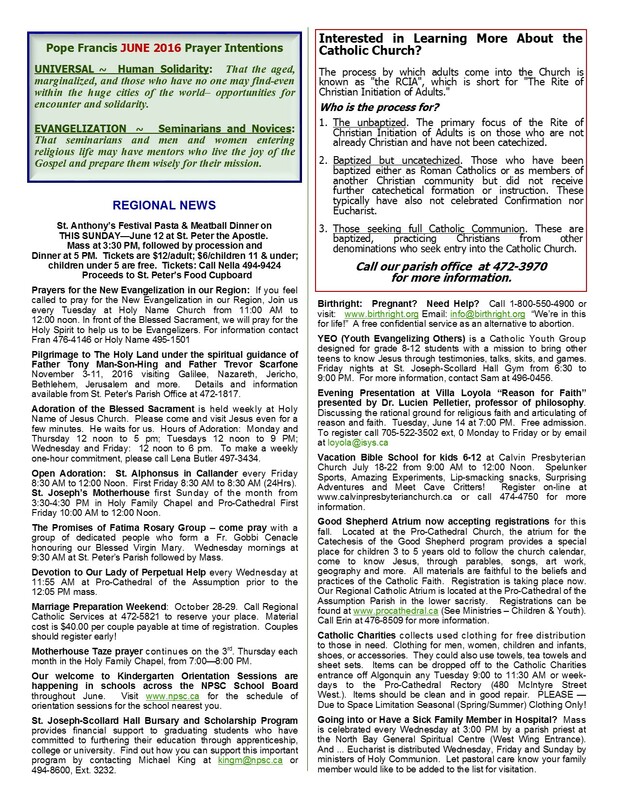 Check out this weekend’s bulletin – Job Opportunities with the Diocese, Pancake Supper, Choir Welcomes New Members, Year-End Financial Information & More! Check out our latest newsletter “Ponderings January 2017” for all our latest news! Bulletin Insert: Discovering Christ – Begins on January 24th – Sign up Now! 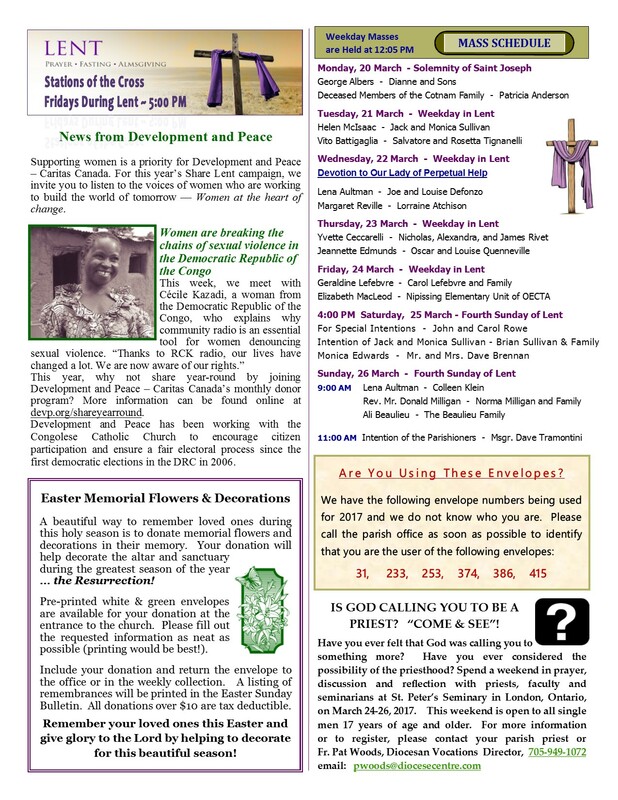 Sorry about the quality of the bulletin this week. Had some glitches that I am working on and hoping to improve on this for next week’s bulletin! Bulletin Insert #2: Christmas Memorial List – Thank you for your donations. Please pray for those people on our list and for everyone who mourns their loss. Bulletin: 11 December 2016 – Christmas Mass Schedule, Advent Retreat Information, Res pect for Life Mass with Bishop Damphousse & Much More! Catholic Women’s League Bazaar Update with Lots of Pictures – It was a very Grinchy Christmas!!! Want to find out more about a great bunch of volunteers a the Cathedral? Click here! Link to Bulletin Insert ~ Development and Peace: Become a Member and learn about injustice and what you can do about it! Thanksgiving Decorations. We are decorating on Thursday so need your donations before then. Thank you! 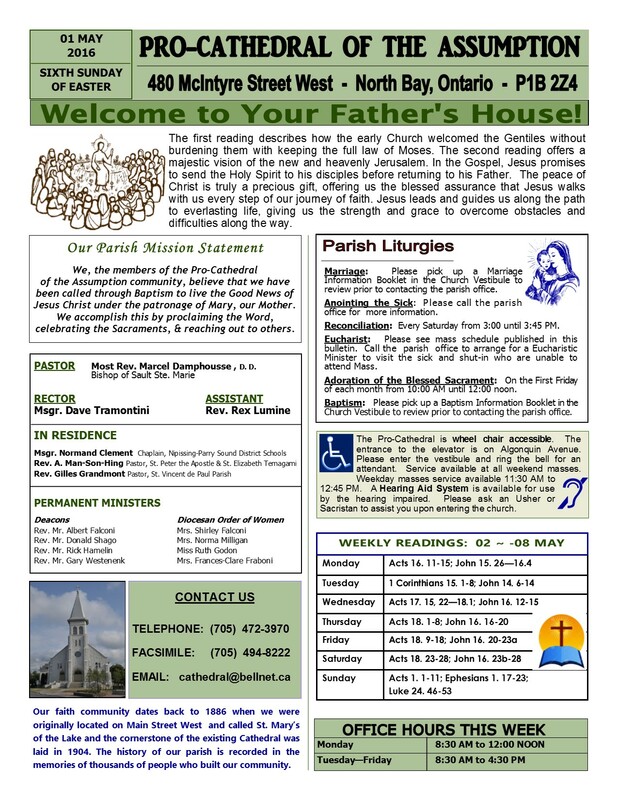 Bulletin Insert: Open House at the Catechesis of the Good Shepherd Atrium on June 18 – Everyone Welcome! Garage Sale Next Week – See Poster for Drop-Off Information & Social Sunday Next Sunday – Check it Out! English & Ukrainian Easter Divine Liturgy in the Byzantine Catholic Tradition at the Pro-Cathedral of the Assumption April 30, 2016 EVERYONE INVITED! Easter Sunday Bulletin – Rejoice! He has Risen! 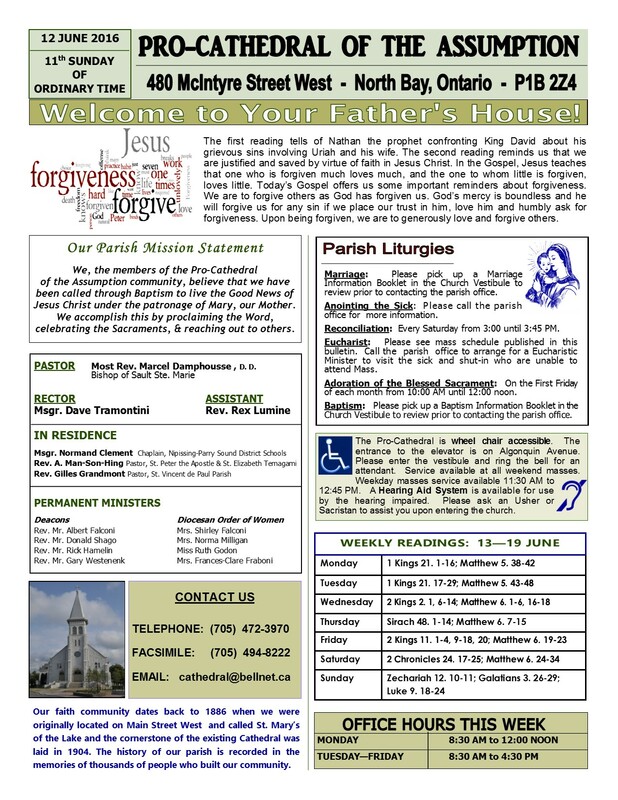 Easter Sunday Insert – Evangelization Summit and New Parish Directory Coming this Summer! We, the members of the Pro-Cathedral of the Assumption community, believe that we have been called through Baptism to live the Good News of Jesus Christ under the patronage of Mary, our Mother. We accomplish this by proclaiming the Word, celebrating the Sacraments, and reaching out to others.